Just sailing along thru Paradise! 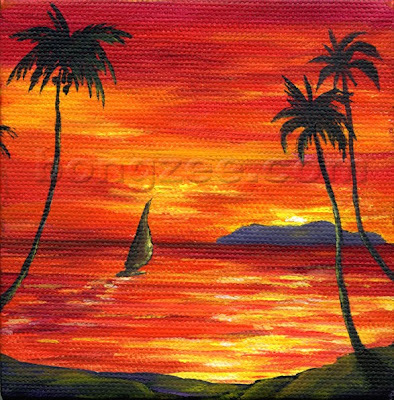 "Red Sky At Night" is an original 4x4 mini oil painting. This is a painting I did a while ago, but somehow didn’t feel that it was quite finished, although I couldn’t figure out what it needed for sure. Then one day (probably when trying to clean up my studio), I put it away and forgot all about it. I recently came across the painting again, and decided now, after not seeing it for a while, that I really liked it, and there was nothing I wanted to change about it. I decided that it was, in fact, finished. To my surprise, “Calm Waters” sold in less than 3 days, becoming one of the fastest sales I have made in awhile. I can’t think of a better way to end another perfect day in Paradise! 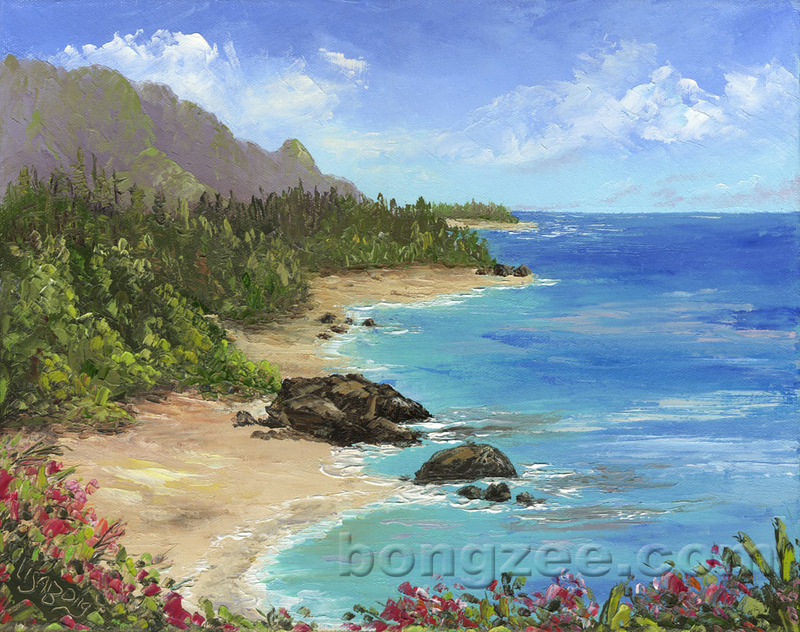 "Another Perfect Ending" is an original 4x4 mini oil painting. 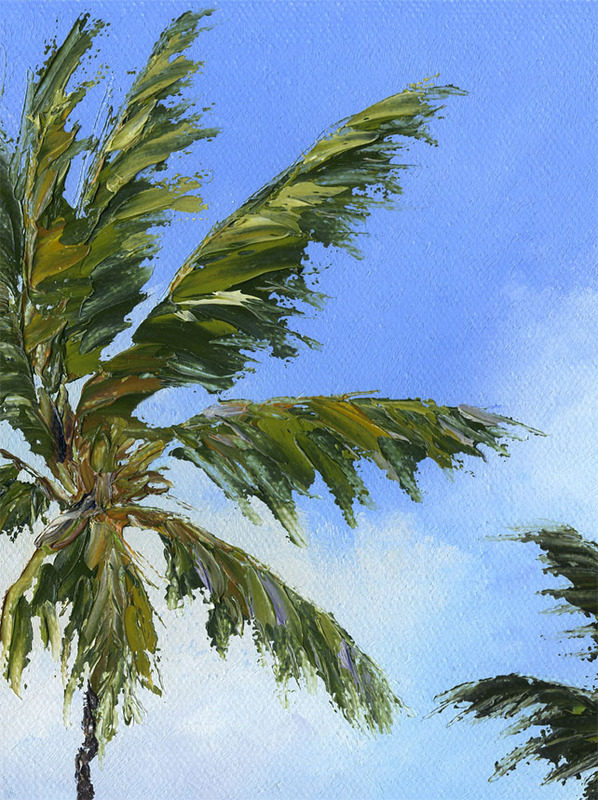 A pair of palms sway gently in the breeze, high above the tropical bird-of-paradise, overlooking the gorgeous turquoise seas. What a great place to spend a lazy afternoon. 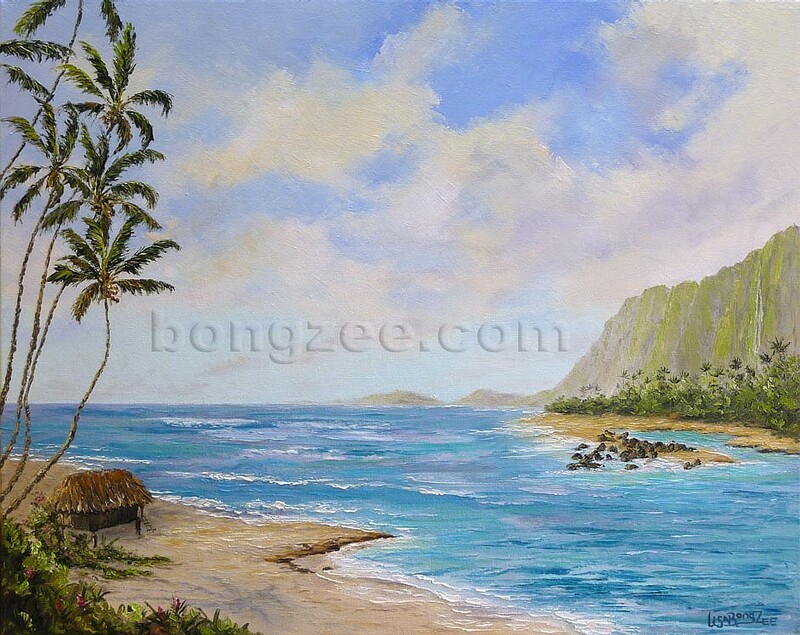 is an original 6x12, one of a kind, palette knife oil painting. It comes professionally framed in a tropical bamboo style, ready to hang. Last weekend the weather was gorgeous, and I wasn’t about to waste it staying indoors. 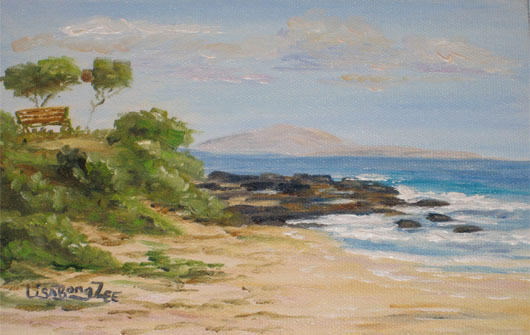 I decided to work on my plein air skills once again. This beautiful little park overlooking the water looks like it might work. It felt great just to be outdoors. It was nice and cool, the birds were singing, the view was beautiful, and I was doing what I love! Another plein air painting finished with still a bit of evening left! Brighton is friendly with the ducks and is waiting for them to come over and say "Aloha"! Good thing I had him on a leash or he would have been in the water swimming around with them! Being a painter makes me realize even more just how lucky I am to live in such a beautiful place! 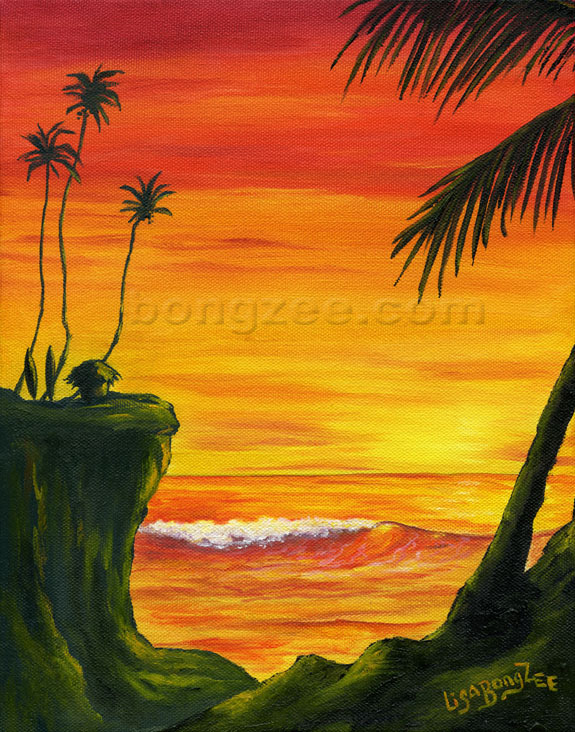 I can’t seem to get enough of these little sunset tiki surf paintings. A surfer's perfect day ends with a brilliant tropical sunset. Life can't get any better than this! "Orange Crush" is an original 8x10 oil painting. 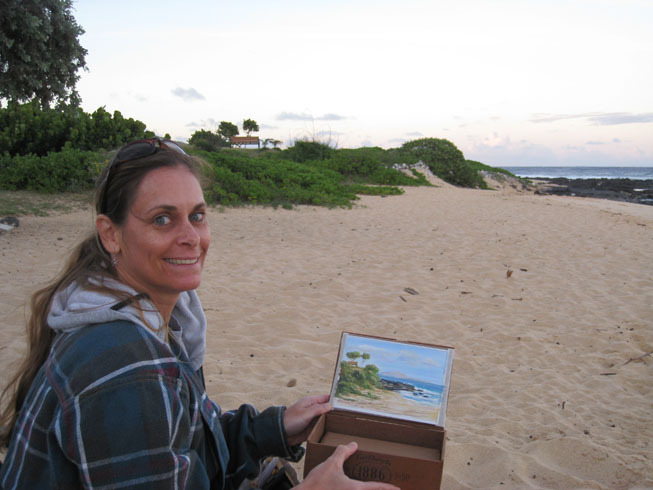 A few months ago I started plein air painting (painting outdoors). It is not as easy as it might look. For me, it is more difficult to judge the colors and values in real life, than from a still (and never changing) photo. Trying to capture the moment on canvas in a short amount of time is a challenge, but just being outdoors makes it so worth it. 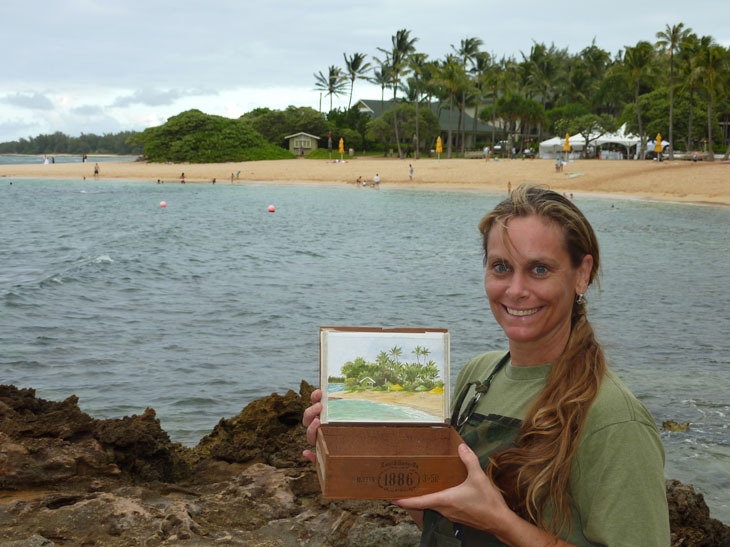 For doing quick paintings without having to lug around a lot of supplies, I made a little pochade box out of a wooden cigar box. No, I don’t smoke cigars, I don’t know how I acquired this box, but it works perfectly. It holds my small brushes, palette of paints, and my 5x7 size canvas, all together. I can take it just about anywhere. Here are a few pics of my latest plein air cigar box painting adventures. This is a view from Sandy Beach, on the east side of Oahu. It was early evening, and the sky kept changing, along with the shadows in the bushes and the reflection on the water. Hard at work with my little assistant, Brighton. Luckily, I was able to finish before the sun went down. My first plein air cigar box painting. 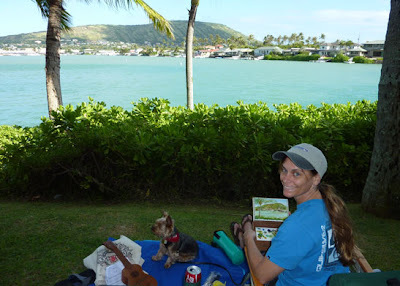 "Sandy Beach Bench - May 19, 2011"
A few days later, we stopped at the Hawaii Kai Towne Center. It is located on Koko Marina, and there was a nice shady little place behind the buildings, overlooking the marina. We spent the afternoon there. Dean kept Brighton and I entertained by playing the uke. 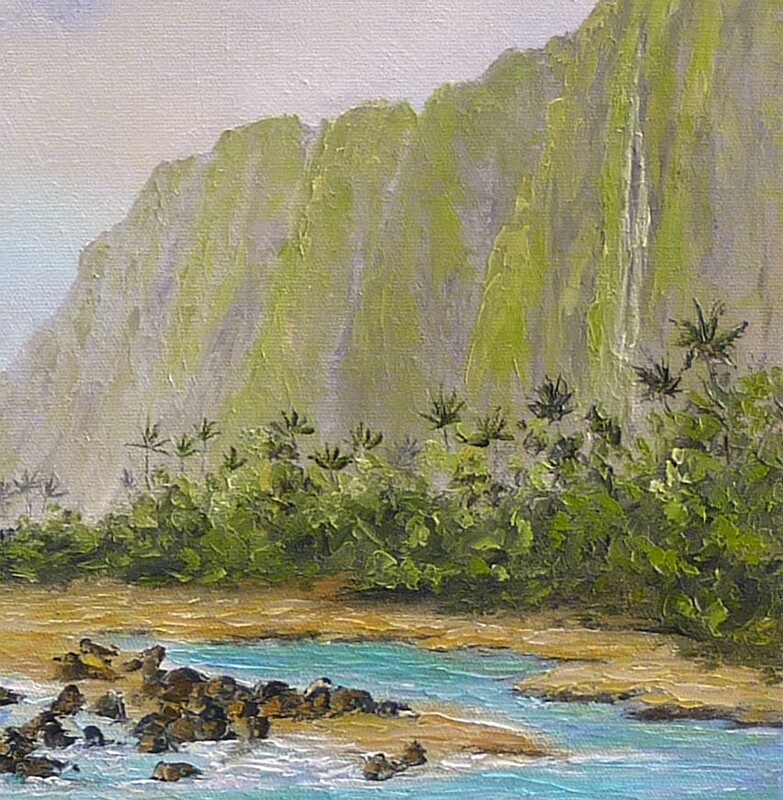 Perfect Hawaiian music to paint to! My little cigar pochade box works great! 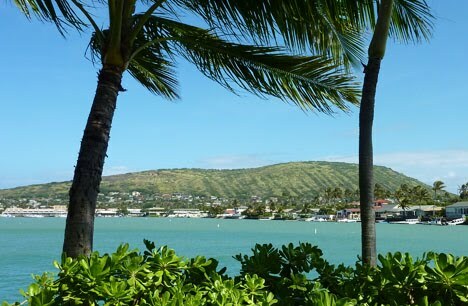 Koko Head in the distance with the Marina in the foreground. 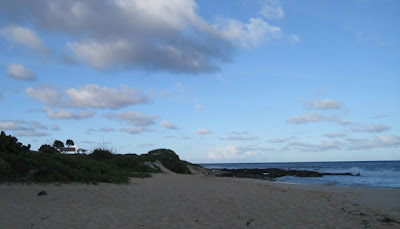 Then, last weekend, we took a drive up to the North Shore. 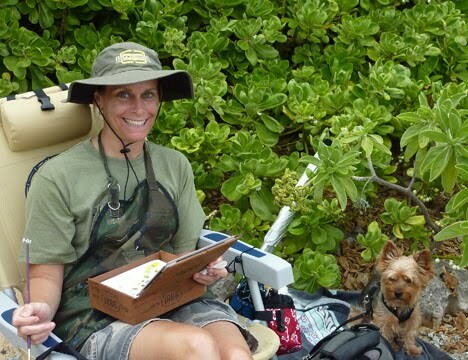 The weather wasn't all that great, but I still took my little cigar box along. 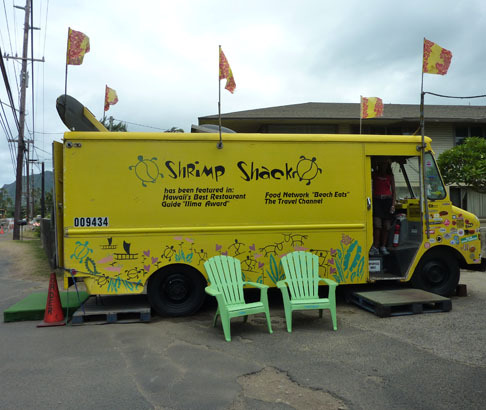 We decided to stop for lunch at the "Shrimp Shack". We have passed by it several times before, and it always looks busy, but we had never tried it. 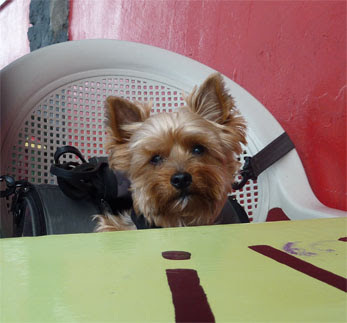 What a cute place, and the owner was so nice. 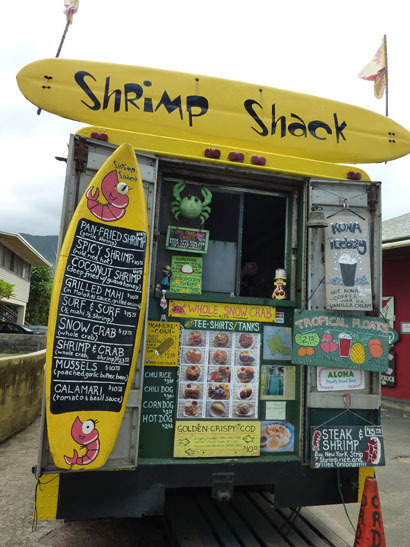 Maybe one day, I will paint this little truck, but for now, I will take an order of the COCONUT SHRIMP! My favorite! Brighton says "Hey Mom, don't forget to order me some too!" 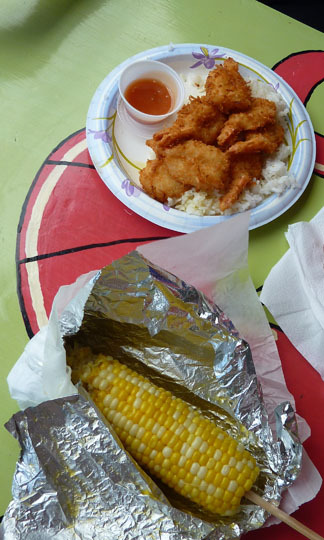 The coconut shrimp was really good, and the locally grown North Shore Kahuku corn was so sweet! 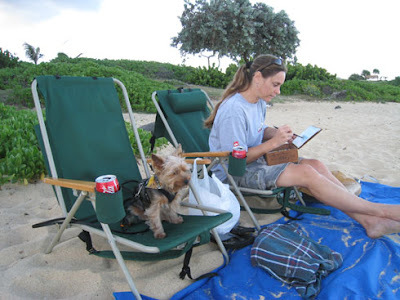 We continued on, stopping at Turtle Bay. 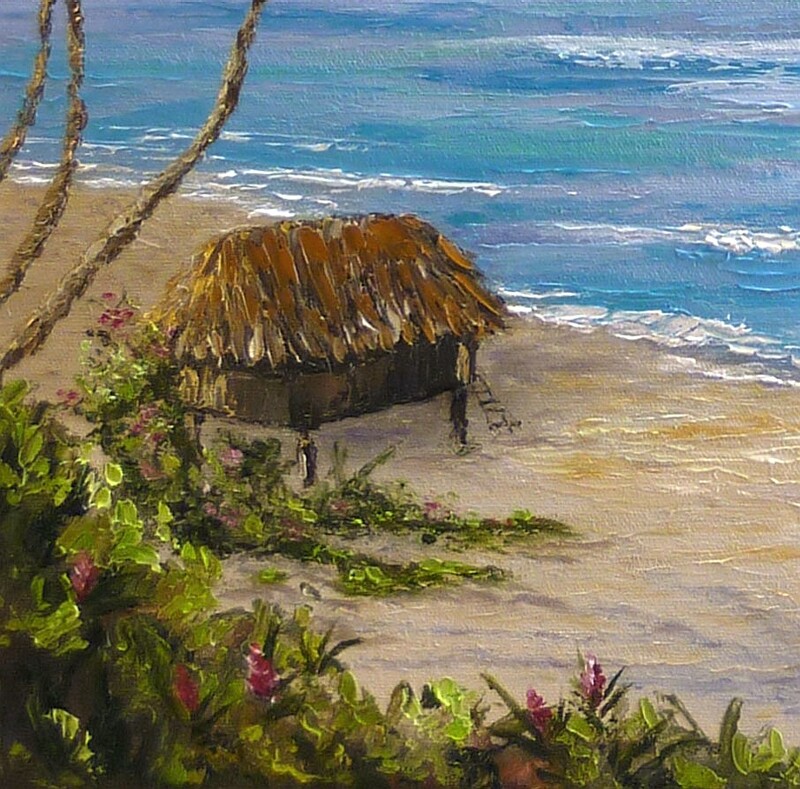 I decided to paint this little green beach shack and umbrellas that lined the beach there. 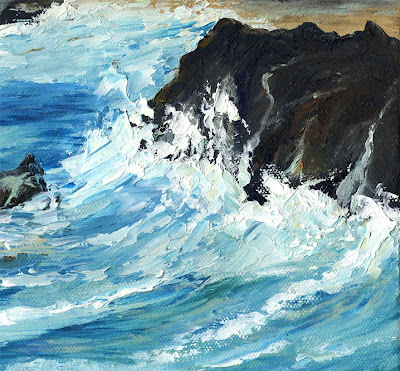 Unfortunately, the weather didn't want to cooperate too much, and we got dumped on at least three times, making for an interesting painting outing. Good thing we remembered our umbrellas. We just had to hunker down and wait it out. It eventually passed and would clear for about 15 minutes before the next set of black clouds rolled in. This scene kept changing, as the beach attendants kept raising and lowering the umbrellas, and opening and closing up the little beach shack, depending on the weather conditions. One minute the beach would be packed with people, and then the rain would empty the place. I decided to leave the people out of the painting. Well, that is a sample of a few of my cigar pochade box paintings. I hope you enjoyed seeing how they were created as much as I enjoyed painting them! 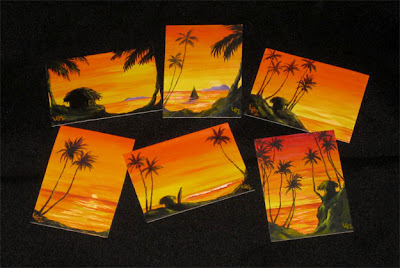 I’ve been working on some new Tropical Sunset ACEO’s. I love how the bright oranges and yellows POP against the black. It really gives it a feeling of warmth and sunlight. 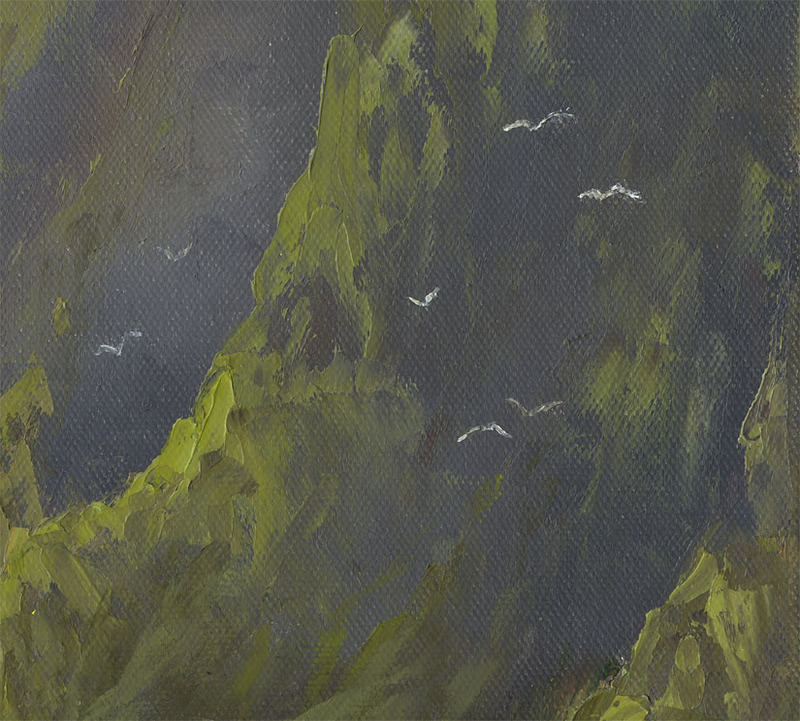 ACEO’s are a great way to collect original art at an affordable price. I recently got back into surfing again, and I realize just how much I missed it. Being out in the ocean brings me complete contentment. I love the smell of salt water in my hair and the feel of the sun warming my face as I sit out there, bobbing on my board, thinking of nothing but the best way to catch a few awesome waves! I think I must have been a dolphin in a former life! 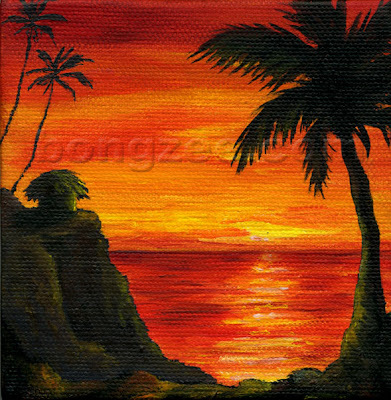 “Perfect sun~Set Of The Day” is my latest original oil. The perfect glassy set of the day rolls in just before the sun says "Aloha" for the evening. It's your last chance to catch that perfect wave! "Perfect sun~Set Of The Day"
is an original 24x12 oil painting. 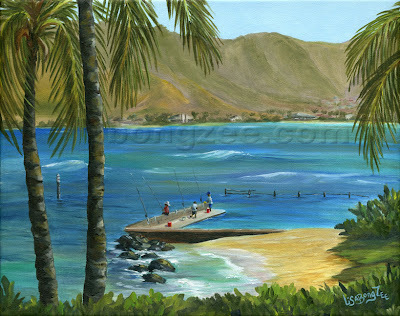 is one of my original oil paintings, depicting fishermen spending the day on the abandoned boat harbor pier of Henry J. Kaiser. 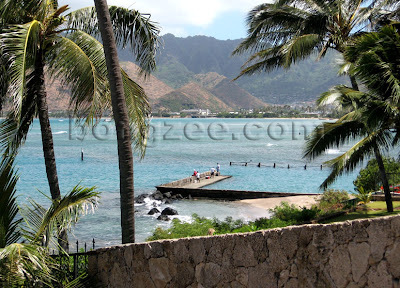 This pier is located on the former “Kaiser Estate”, a 5 ½ acre oceanfront parcel of gorgeous island land. 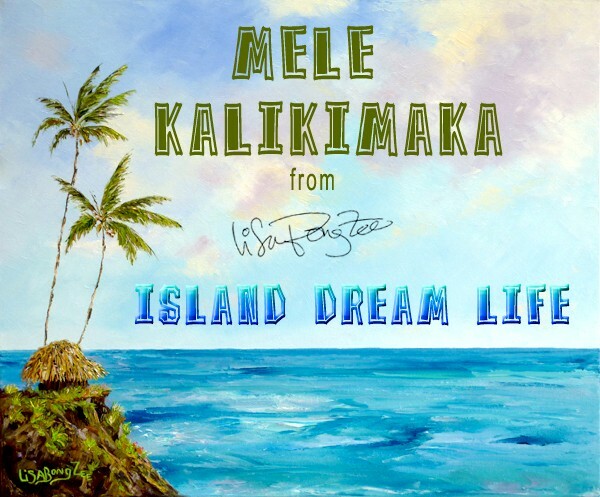 Henry J. Kaiser was most well known for developing the Hawaii Kai community, on the east side of Oahu, Hawaii. The pier is a great fishing spot, and many locals catch their weekend dinner here! The Kaiser Estate has changed hands many times, and if you happen to have some extra many-millions lying around, this beautiful little pier could be your very own! 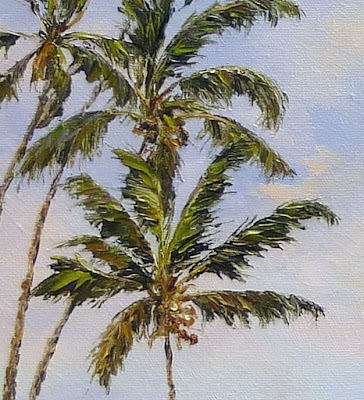 A lady in Florida recently commissioned me to do a very special piece for her, as a gift to her husband. He was graduating from the Naval Academy, and she thought an original painting would be a perfect way to celebrate his great accomplishment. 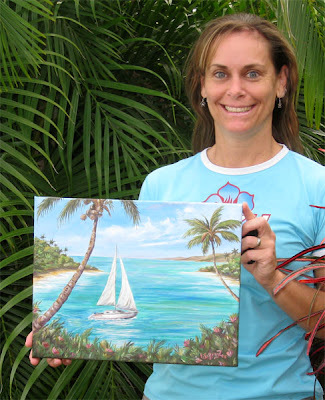 The love of their lives is their sailboat, Zephyr, so she wanted an original oil painting of their boat. 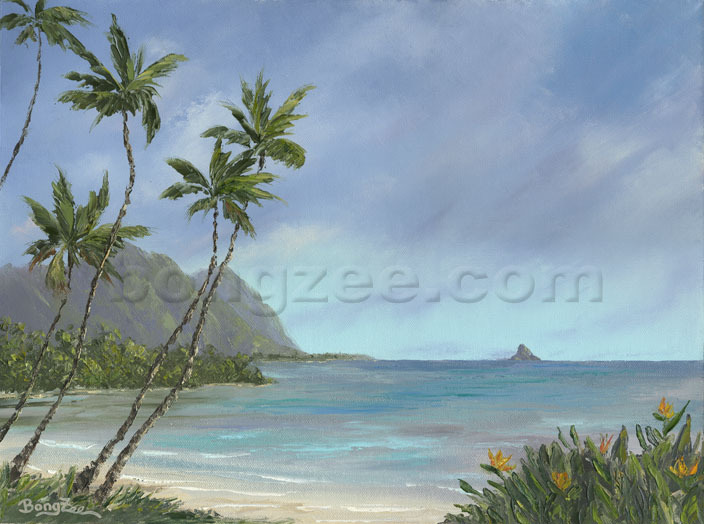 She couldn’t figure out exactly what type of setting, so we decided that since they love Hawaii so much, why not put Zephyr in a tropical island setting. It was a bit of a challenge for her to send me photos of the sailboat and communicate what she wanted without her husband finding out, but somehow everything worked out great. She is such an easy-going, likeable person, it made my job easy! 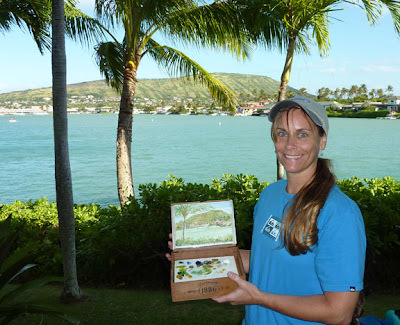 When she presented the painting to her husband, she told me that he almost shed a tear. 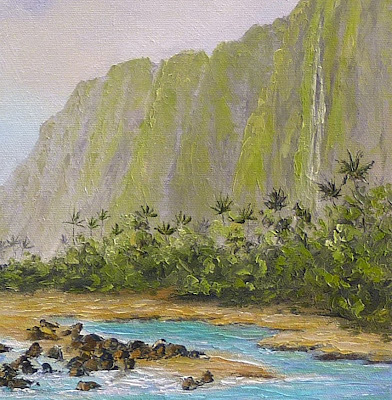 I was happy to hear that he loved the painting, but I am sure the emotion really came from him thinking what a wonderful wife he had, to take the time to think up such a meaningful, one-of-a-kind gift made especially for him. 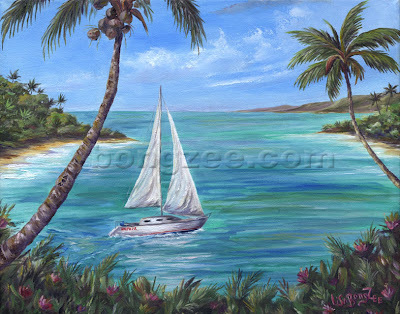 “Zephyr In The Tropics” was a fun piece to work on, and having it set in a tropical paradise is what I always enjoy painting most! We personalized it just a bit more by “carving” their initials into the trunk of a palm tree. 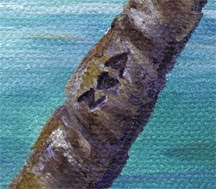 It is not noticeable right off, but as your eye wanders around the painting a bit, you finally notice that little detail that makes the painting all the more special. 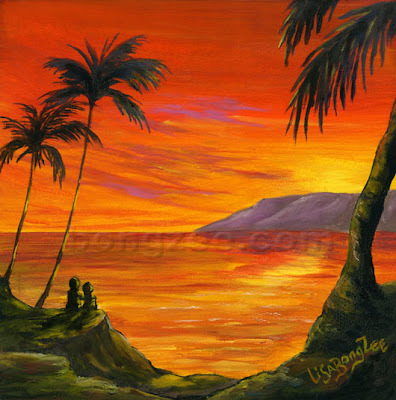 A couple in love sit together under the swaying palms, soaking in their last gorgeous sunset in Paradise. 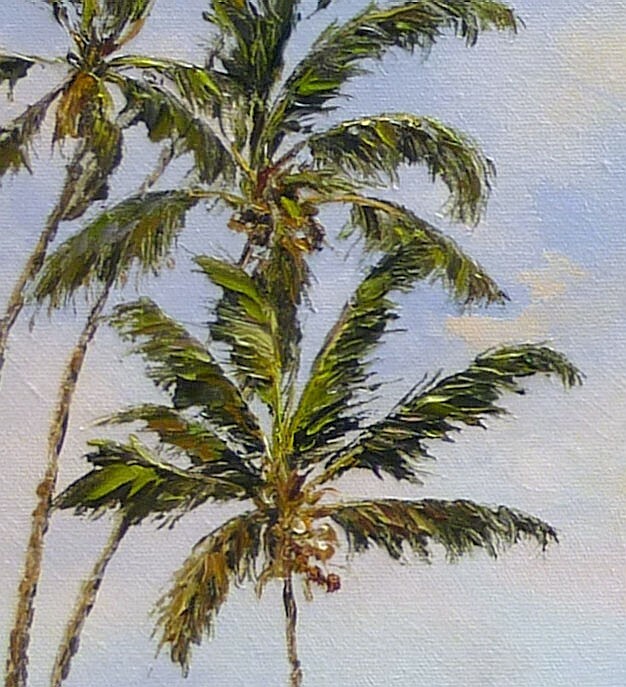 is an original 6x6 oil painting.